Who else is ready to jump out of their seat, into an airplane and jet off someplace nice and warm!? I’m standing on my chair with both hands in the air!I feel like I can’t complain about being a bit chilly here in Nashville when Chicago is -12° and buried in snow and ice. BUT that is one of the reasons we moved here, so I should be thankful it’s a mere 26° here in “the south.” I’m sending prayers for safety and warmth to everyone up north! If you’re one of the lucky ladies who happened to plan a vacation during the cold front… high five girl! Let’s pack those bags and hit the freakin’ road. Gus and I leave for Scottsdale and Palm Springs on Friday for a little belated anniversary adventure. Our first vacay together since our honeymoon! 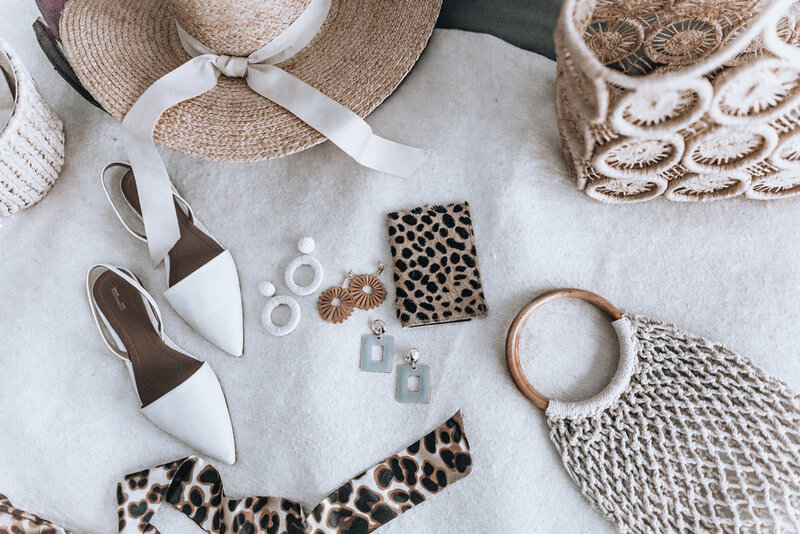 I’ve been dreaming of chic resort wear and woven everythingsince we bought our tickets and am finally organized enough to share it with y’all! My vibe for this round is vintage chic! WOVEN WONDERS - Hats, visors, bags, and shoes! Make all my accesories woven and bamboo please :) Most of my hats and bags are from Hat Attack. I’m also obsessed with everything from Ulla Johnson right now. Their shoes, bags, dresses… basically everything is so unique and calling name. Saving up a pair of her sandals right now! This little net bag I’m holding is from Kayu , I think you’ll really love all their bags and a few are on sale too! WHITE PANTS - A flared high waisted number to wear over swimsuits and with little crip tops like this! I just bought this pair from L*Space that fit great and aren’t see through! THE SUNDRESS - I just found this brand called Posse and love everything they design. It’s an Australian label reconstructing vintage pieces and they are stunning! I ordered this white dress I’m packing from there but florals, ruffles, and polka dots are all a good idea. I linked a few options below! There’s even a brand called Sundress that makes classy and colorful pieces too! HAIR SCARFS & HEAD WRAPS - Every outfit is better with these babies. Tie them to your braids, buns, bags…anywherea and everywehre. I’m bringing at least 5! STATEMENT EARRINGS - I went with a wooden, white and colorfully blue pair to mix and match all week. HIGH WAISTED SHORTS - Gotta have ‘em. These are a few years old from Zara but classic. For denim, Levi’s are the bomb! I have their 501 shorts I’m packing too. SWIMSUITS - I have a full Swimwear Roundup here with all my favorites from the season! VINTAGE TOPS- The star of my vintage vision. I bought one from Posse and this one I’m wearing that is on sale for $28 right now in all sizes!